Large Rugs - Experience The Exceptional Range At Carpet Court! Rug's have many purposes, however one that is most commonly misunderstood is how they can be used to create different zones. Large rugs are a great way to section off spaces or create zones in larger rooms - such as placing a rug underneath a dining setting or beneath a lounge and coffee table of a living space. In this case, two different rugs are used in a single open plan living room, creating the illusion of different zones. 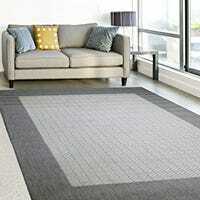 View Carpet Court's fantastic range of large rugs and find the perfect solution for your home today. What are the benefits of having a large rug? As today’s flooring trends often favour hard surfaces such as timber, tiles or floating floors in laminate, hybrid or vinyl planks, a large rug brings warmth, comfort, softness and insulation to a contemporary home décor while protecting the hard floor surfaces. Not only does a large rug add a textural element to the room, but in modern open plan living it can help to create defined living and dining spaces. Practical elements aside, a large rug can create a certain mood in the room. It can completely transform a space with its colours, textures, shape or size. A luxurious rug in bold colours or patterns can be a statement piece or with subtle designs and neutral tones it may be a refined enhancement to the décor. What are the measurements of large rugs? Big, bold and beautiful rugs from Carpet Court range in size and shape. Our selection of soft and inclusive round rugs such as those in the timeless Evoke collection measure up to 2.40m x 2.40m. If a classic hall runner is on your list of must-haves, many rugs in our range are up to four metres long to lead the way along the lengthiest of hallways. Our Eco Sisal collection of stunning natural fibre sisal rugs sourced from renewable plantations measure 4.00m x .80m as do the classic hallway runners in our traditional Empire collection. Botanical offer exquisite Japanese handmade rugs for your living or sleeping areas measuring 3.20m x 2.40m while the highly popular Colombo and Ishka ranges measure as large as 4.0m x 3.0m. With today’s modern outdoor spaces becoming as comfortable as our indoor living and dining rooms, you can add a little glamour and comfort with large polypropylene rugs from the Alfresco and Suva ranges which are highly durable, UV stable and easily cleaned. Where can large rugs be used? Large rugs can complement the décor in your formal lounge and dining rooms while being equally appealing in casual open plan living spaces. A large wool or wool blend rug brings added warmth and comfort under foot in the bedrooms and in a durable polypropylene synthetic fibre it is the perfect accessory to your on-trend alfresco area. What colours and textures do large rugs come in? A large rug can be a vibrant feature and make a big impact in the room. Our rug collections include a vast range of colours and textures extending from subtle, neutral tones to deep earthy shades, bold contrasts and rich colours. Are affordable large rugs available? While big is better and bold is beautiful, large rugs don’t have to be unaffordable simply because of their size. At Carpet Court we offer a range of rugs online and in selected stores which are made from a variety of fibres, including pure wool, synthetic and natural fibres. 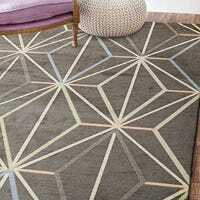 In a natural cotton and jute fibre blend, a big 3.20m x 2.30m rug in the Abode Chevron and Abode Diamond designs are excellent value being handmade and double-sided for as little as $449.00. At Carpet Court you will find 100% pure wool rugs such as the exquisite hand-dyed Tobra rug for less than a thousand dollars as well as a big range of synthetic fibre rugs to suit any budget. If a large rug is just the thing for somewhere in your home, check out the huge choice available online and in selected Carpet Court stores near you.